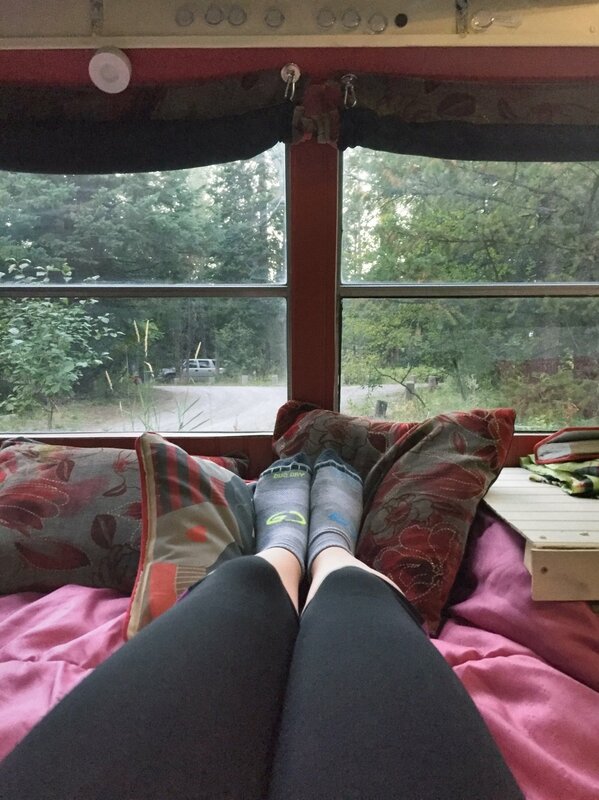 Alexandra is traveling the U.S. solo in a vintage school bus. Armed with knowledge from watching build out videos on YouTube, she tackled the conversion process almost entirely by herself. Since leaving San Diego two months ago, she has already explored Nevada, Idaho, Wyoming and Colorado. During her year-long journey, she will be visiting schools that are lacking the resources for an art program. She hopes to raise money through donations to gather supplies to donate to classrooms, along with a free art lesson. It was once was used as a school bus (short bus). I purchased the bus on New Year's Eve of 2015. It was the most exciting/questionable day of my life. I moved into the bus for a month while still working in San Diego to save money. I have been traveling in the bus for two months. So in total I have lived in the bus for three months. But I plan to stay in the bus for a few years. What was life before this like? Life before this for me was...close to normal. I attended high school, studied art in college and studied abroad for my last year of school for 12 months in Florence, Italy. I love traveling, but not in a touristy way. I like to fully emerge myself in the places I visit. When I finished school in Italy, I picked up a stagnant job back in San Diego and knew that was not how I was meant to live. Why did you leave that life behind? When I left San Diego, I was living and working in a close-knit beach community. I left all my friends, coworkers and the guy I was dating behind. I left behind some job opportunities, as well as all connections I had down there. But I really did not think twice. I don't really know many motivational phrases, I don't live my life by a motto, but the one thing I think about a lot before setting off on a new journey is the saying, "Life begins where your comfort zone ends." So I felt it was time to leave my comfort zone. I also felt that after living in Europe for a year and seeing so much, that I was kind of ashamed I had not seen any of the U.S., my own backyard. I wondered what the people and places were like, how different they were going to be than Southern California. Why did you choose a bus? Why not another vehicle? At first I was set on buying a camper, but the more I watched videos on YouTube of folks doing bus conversions, the more interested I became. For about three months, I watched people converting buses into campers and started taking notes in a red note book. What they did, how I could do it differently, what kind of aesthetics and decorations I would like. I almost filled up the notebook and then thought that I can definitely do this. I would just take it one step at a time, and if a problem came up, I would solve it. I became very confident in myself. I created a budget, and I knew it was going to be a challenge. I wanted to challenge my creative and technical skills. Tell us about the conversion process. The conversion process was so amazing. I learned so much. Not only about building and problem solving but about being a female and taking on a large project like this. I bought the bus with all the stinky old school bus seats inside and just thought "Oh no, what did I just do? I just bought a school bus. What am I doing with my life?" But everything worked out. I just did as I planned and took it one step at a time, one day at a time and one problem at a time. Then I tore up that dirty old black rubber flooring. I cleaned it out like I have never cleaned anything so well in my life. One step at a time I figured out how to lay down the final flooring and what type of insulation worked best for my bus walls. I painted the wood paneling, the ceiling and the outside of the bus. Of course everything was done on a budget, so I had to find cheap ways to do everything. I had to use spray paint for the outside of the bus instead of doing a legit paint job. I salvaged lots of wood from construction site dumpsters and back alleys. I also did hours and hours of reading and research. In the end, I got everything done using two power tools only (a drill and circle saw). I did get help with a few things that I was physically not capable of doing on my own. Some of the biggest difficulties I faced were not technical things like figuring out how to get water pressure for my sink, or how to build a bed for the first time in my life, but the biggest personal problems I faced were comments from other people. Everyone in the neighborhood of Pacific Beach, San Diego, asked what I was doing, because I worked on the bus in the streets, so everyone knew who I was. I received everything from "You can't travel alone as a girl." to "Is this your boyfriend's idea?" to "What a cute little DIY." and even "Where is your boyfriend?" Comments of criticism from people assuming I did not know what I was doing simply because I was female. "Call my friend to do your cabinets for you. He knows what he's doing." or "Don't build it like that. That will not work. Do you want me to do it for you?" But at the same time, I got so many encouraging comments. One older gentleman said, "I wish my son was more like you. You're very brave. You will have a life-changing journey." Walk us through your bus. What can we find inside? Entering the bus, there is one seat in the front, just for the driver, I put down some AstroTurf where the passenger seat would be, and I consider that my "front lawn." Taking a step inside, immediately on your right side is the table. There are two seats facing each other with a table in the middle. The seats are original olive green bus seats I saved, and they are now covered with colorful blankets. I made the table in the middle and put down black and white tiles, the table seconds as an extra large chess board. Chess pieces are next to the stove in a drawer. On entry, on the left side is the stove, which runs off propane. Next to that is a top-opening mini fridge that runs off solar power (I have 200 watts of solar on the roof). Next to that is a sink I bought down in Mexico—a ceramic floral sink. I get water pressure from using a hand pumping to pressurize a 2-gallon water tank. Under the stove, fridge and sink are storage for plastic dishes, pots and pans, dry food and other things like paper towels. In the back of the bus is my bed. The bed is very comfortable and the center is removable, so on driving days I can change it from a bed into two couches facing each other. Under the bed is where I store all my clothes. There are book shelves above the bed with a night sky painted on the bottom and glow-in-the-dark stars. You can only see the stars when laying down and looking up to the sky. One thing you will not see that is very important is my secret hidden compost toilet. Yes, I have one for emergencies (luckily, it doesn't get much use at all but it's always there just in case). I do not have a shower, but showers are easily found everywhere. Anyway, that's the bus. A few small details are my lights that all have magnets on the back and my hooks are all on magnets—I use magnets for everything I possibly can. Because the ceiling is metal, magnets work fantastic for smaller uses or for decoration. I have magnetic spice containers above the stove, and I can control where I want to stick my lights around the bus. Yes, I had a rough budget. My bus cost me $3,750 exactly. I think renovating the interior cost me about $1,500, which is not bad. The thing that started to break the bank was once I started traveling, the bus broke down a few times. Getting repairs has been a little bit pricey. I worked really hard and saved money to take this epic trip. I use saved money and have a few jobs I can do on the road. Selling art is one, and working for WAG, a dog walking app, is the other. But I am going to have to get a seasonal job soon, but I am kind of excited about working someplace new. In exchange for food and a place to park in Colorado, I did a "work away" through HelpX. I did about five hours of work for five days a week for this lady who needed help moving in exchange for use of her car, food and a place to park. I did not get paid in money, but I saved a lot in exchange for staying with her. Where have you been so far? Where do you plan to go next? I began my journey in San Diego and drove up the east of the Sierra Nevada mountains all the way up California. I went to Reno, Nevada, and up to Burning Man from there, which was awesome. After that, I drove east through Nevada and Idaho all the way to the Grand Teton mountains and Yellowstone in Wyoming. After staying there for a while, I headed south through Wyoming into Colorado. I stayed in Denver and Boulder. After a big repair and a few weeks spent in Denver, I went south again into New Mexico, then swung east into Texas. I am now here, in big bad Texas. I plan on spending some good time in New Orleans and Florida, then heading up north along the east coast. What has been the biggest adjustment to living small? So I started unintentionally downsizing my life when I moved to Florence for a year. I got rid of a bunch of stuff. When I moved back to the U.S., for the first time in my life I decided to get a studio apartment and live alone. Again I downsized stuff and got kind of used to living alone. Just a disclaimer, I am not a lonely person at all. I am around people all the time and love it. Moving into the bus was the biggest downsize. I sold my bed and all my furniture. I got rid of trash bags full of clothes and jewelry and purses (I am really bad at getting rid of clothes, but I did it). I fit what I could in the bus. And here I am now. I go through my things once a month and try to downsize or make sure I'm not taking on too much more stuff in the bus. Luckily I got to make the transition over a two-year period, but it feels so good. Stuff is such a burden. It really is. It makes me sad when I hear people my age talk about what they want. They want a boat, a new car, all this stuff. What memory sticks out so far? What sticks out the most to me so far has been the genuine kindness of the people I have met everywhere. I made a friend my age in the Tetons who loved fly fishing. He wanted to share that with me, so he spent a week teaching me to fish. When the bus was in the shop and I had no place to stay, the mechanic and his wife offered a spare bedroom up for me and a hot shower, bought me food and really went above and beyond. Just recently, I was going to pay $15 for a shower at a truck stop and a trucker gave me one of his free shower tokens. I try to create one piece of art for every state I go to, as well as add photos and a little bit of writing about my trip. My next plan to help share art with those in need is to donate art supplies to schools. I will be taking a year to travel around the United States and find schools lacking the resources for an art program. I hope to raise money through donations to gather supplies to donate to classrooms along with a free art lesson. I plan to donate not only supplies that will last for a long time, but also packets for the teachers with step-by-step lesson plans for art classes. I will take off on the trip around the US starting in September 2017. I hope to get any organizations involved that have the same interests in sharing art with youth. Photos courtesy of Alexandra Oetzell and Kyle McBurnie.